This novel, the third in the Parade's End series, begins and ends on Armistice Day. The rest of the book follows Valentine as she considers whether or not she should become Christopher's mistress, and Tietjens' experience of life at the Front. There, his mind jumps back and forth, dealing with the past and imagining a future with Valentine. He becomes Officer in Command of a fine regiment of 'pals' and proves himself to be a capable leader of the men. He worries that he is like Hamlet, unable to make a decision regarding Valentine, but ultimately he takes a stand. He has been maligned and taken advantage of for too long. It is time for him to put himself first. Indeed, this realisation comes in a literal blast of realisation when he is blown up in the trench and half buried alive with a fellow soldier. He tells his hollering comrade that he cannot come to his aid until he has helped himself first. It is time for him to walk on that hill, like he did that morning with Valentine, to show the world that 'a man could stand up'. But they do not shirk from their duty but maintain their position because it is what is expected of them. This is the most impressive thing about the novel; its depiction of life in the trenches, especially because the author lived through it himself. How can the world forget the terror that these men lived through as millions of men faced each other on the battlefields? 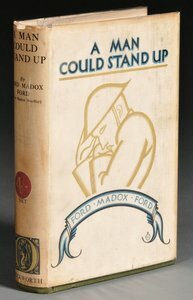 Because of Madox Ford, at least some will remember. It is amazing then that Madox Ford manages to add any beauty at all to the book. Usually, the beauty is associated with Valentine. Tietjens thinks about how 'she made the sunlight', and decides that he will forgo his position at Groby, his former life and friends, even the fine claret at the club, to take her as his own. He says that when he remembers her, he recalls her mind. Her physical body is not the inspiration of his love. He longs to talk and talk and talk some more with her, as theirs is a meeting of minds and to do that would mean that they must live together. As with the other books, there are moments of pure romance when this soldier turns his mind to Valentine. Despite being snubbed by his general and being denied his Victoria Cross, Tietjens maintains his steadfast belief in the goodness of Valentine Wannop. Even when they are thrown together by the wicked machinations of Edith McMaster or when Mrs Wannop pleads with him to think again about her daughter, he decides to stand up, to step out of the shadow of the old world, out of the hole that is duty and honour and take her by the hand as his chosen partner in life. A delightful irony is revealed when Tietjens admits that 'Fortunately, there was the heir... Otherwise he could not have gone with that girl!'. How wonderful that the pregnancy-lie used by Sylvia to trap him, is what ultimately frees him and allows him to live with his beloved Valentine. Such symmetry in this collection of novels makes them all the more satisfying, and at a little less tragic somehow, to know that Teitjens will, in fact, never bring Valentine to Groby.